Love the ride, enjoy the freedom and fun…. 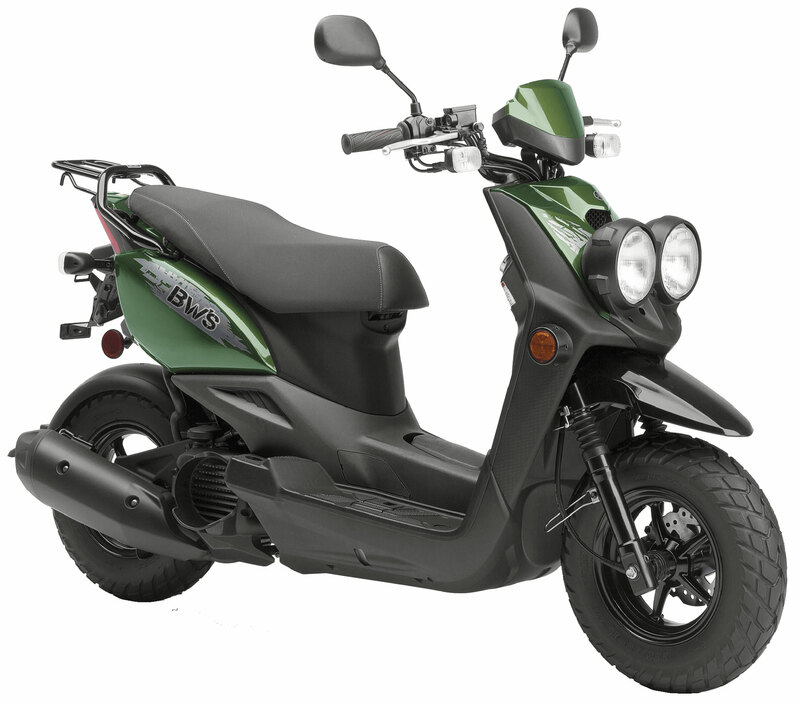 Big on fun and easy on the wallet, the gas sipping 4-stroke BW’s 50 is your ticket to an independent city lifestyle. It’s designed to take the urban mobility concept to an exciting new level. Love the ride, enjoy the freedom and fun. Spacious 23 litre, lockable under seat storage can hold elected full-face helmets or other items like a backpack, lap top computer, rain suit etc. • 49cc, liquid-cooled, SOHC, 3-valve, fuel injected, 4-stroke engine produces peppy, easy to use power with incredible fuel economy. The concept of this environmentally friendly engine is solid performance with low emissions and excellent fuel economy. • Fuel consumption of approximately 55 kilometres per litre or 158 miles per gallon (imp.). Your actual consumption may vary. • The lightweight aluminum cylinder features a ceramic composite coating which is applied directly to the aluminum block, eliminating the need for a liner or sleeve. The ceramic coating insures faster, more uniform heat dissipation, reduced friction and a longer service life. • Special “carbon cutter” valve design removes any carbon build-up on the valve stems to keep the engine operating at maximum efficiency, especially important when the unit is being ridden at slow speeds in stop & go traffic. • Roller rocker arms are used to actuate the valves. These specially designed rocker arms not only reduce friction for increased power, but also reduce mechanical noise for a quiet, enjoyable ride. • Lightweight aluminum piston and carburized connecting rod provide excellent performance with great durability. • Liquid-cooling is used to maintain stable engine temperatures even during stop and go riding. Liquid-cooling allows for a higher state of tune for increased engine performance, while also reducing mechanical engine noise. The radiator and cooling fan are positioned longitually in the frame on the right hand side. • 19mm Mikuni throttle body fuel injection system provides excellent fuel economy, fast, easy starting and low emissions. Other benefits of fuel injection include choke-free starting, automatic idle adjustment and crisp throttle response. • The fuel system has been designed to accept E10 fuel (10% ethanol fuels). 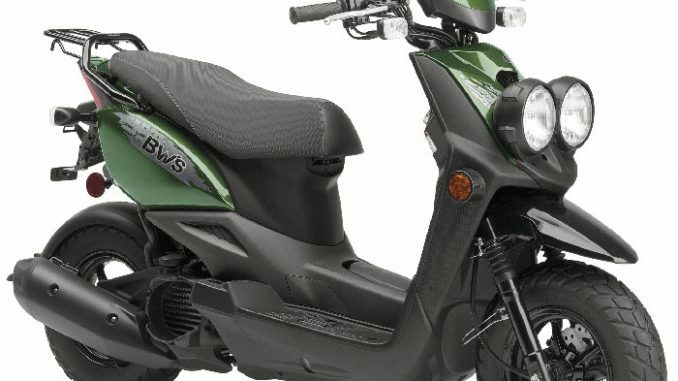 The BWs 50 uses regular 87 octane gasoline. • 16 bit ECU controls the fuel injection process. • Easy access, paper-type air filter is used. The air box is specially designed to reduce intake noise. • Fully automatic CVT transmission (CVT = constantly variable transmission) ensures easy “twist-the-throttle-and-go” operation. There is no clutch lever or gear shifting involved … the transmission is fully automatic. • Maintenance-free T.C.I. (transistor controlled) ignition system with 3-D mapping provides a precise, high-voltage spark for fast, sure starts and crisp engine performance at all rpms. • Air induction System (AIS) is used to further reduce harmful exhaust emissions. The AIS system injects fresh air into the exhaust to ensure complete fuel combustion, thereby reducing both hydrocarbons (HC) and carbon monoxide (CO) emissions. It also helps to maximize the function of the catalytic converters. • Environmentally responsible exhaust system produces a very quiet exhaust note. The muffler contains dual honeycomb-style catalytic converters to further reduce exhaust emissions. • Rugged, large diameter, step-through “under bone” steel frame provides excellent durability and makes getting on and off the unit very easy. • Wheelbase, centre of gravity, weight distribution and tire design, have all been engineered to provide light, agile handling and great manoeuvrability. • Wide floorboards and front leg cowl enhance rider comfort and provide good splash and wind protection. • 26mm front fork provides 58mm (2.3″) of wheel travel. Rubber fork boots help protect and extend the service life of the fork seals. Large diameter outer fork tubes offer a beefy / rugged image. • Single shock unit swingarm rear suspension with 56mm (2.2″) of wheel travel provides good ride quality. • Lightweight, rugged 5-spoke aluminum “mag” wheels are fitted with wide, aggressive 120/90-10 tires. These wheels & tires are well suited for rough, “pot holed” urban roadways. They also provide lots of grip and help create the BW’s unmistakably fun look. • Hydraulic front disc brake with single piston caliper and stylish 180mm “wave style” rotor combine with the rear drum brake to provide serious stopping power. • Both front and rear brakes are hand-operated like on a bicycle … making riding simple and fun. • Instrumentation includes a speedometer, odometer and fuel gauge. There are also warning lights for coolant temperature, high beam, turn signals and an engine warning light. • Spacious 23 litre, lockable under seat storage can hold selected full-face helmets or other items like a backpack, lap top computer, rain suit etc. • Plush seat provides excellent comfort and plenty of room. • 4.5 litre fuel tank is accessed via a panel on the “foot tunnel”. This location keeps the centre of gravity low for easy handling and minimizes mess if some fuel gets accidentally spilled. • Multifunction, 3 in 1 main key switch combines the ignition, fork lock and under seat storage compartment lock into one convenient switch. This switch also features an anti-theft “shutter” that can be closed to prevent someone from tampering or attempting to force the ignition switch. • Dual 35 watt halogen headlights provide excellent illumination and rider visibility as well as enhancing the BW’s tough yet sporty rally styling.